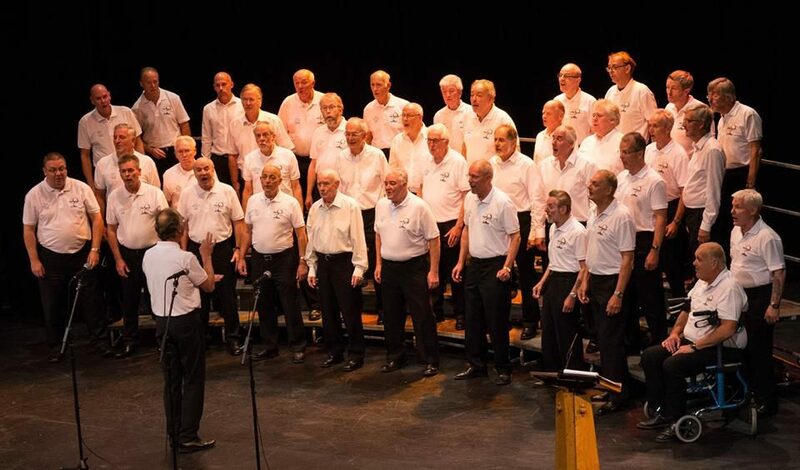 Welcome to the website of Wight Harmony, the Isle of Wight's premier male Barbershop chorus. Here you will find all you need to know about us - find out more about us, how you can hire us for your special occasion, how you can join us, where you can see us performing at public events, or how to simply contact us. You can also find out about a cappella singing in the barbershop style - 'What's barbershop?' 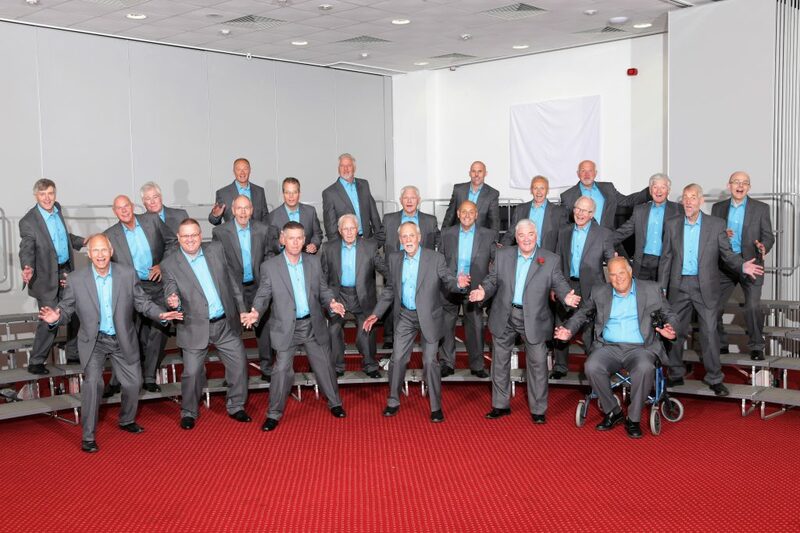 Do check out our gallery to see Wight Harmony in action! I am Dave Bryant, the M.D. [Musical Director] of Wight Harmony. We have around 40 very friendly singers who meet each week at rehearsals and work hard at learning songs at home. We love to perform at weddings and special occasions and would love to sing at any event you may be having. We always welcome new singers too through "Learn-To-Sing" courses and by simply looking in throughout the year. I'm seen here with our latest talented Learn To Sing guys; six of them have remained with us. 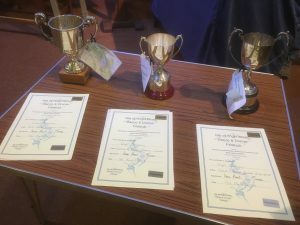 We also have our talented quartet, Quaynote, who complement the main chorus’ repertoire at performances, and also compete in national quartet competitions, their latest success being at the 2018 Gosport Music Festival where they won the Barbershop Small group [8 or under] Class and the Christian Music Section with a credible 92% score . Quaynote are also available to sing at weddings and similar celebrations etc. – see https://www.facebook.com/quaynotequartet/ for details. We currently have three other developing quartets in the club - Thirty Quid, Part Exchange and MTQ. We also love to extend a very warm welcome to all barber-shoppers visiting the Island and who wish to come to our rehearsals [details below]. Singing a cappella is great fun and so very satisfying. They say it's the harmonies! Come and try it out! If you are interested in listening to us, joining us, booking or visiting us, or simply browsing, welcome to Wight Harmony! 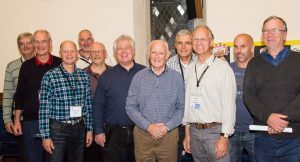 January 2019: As an organisation, the British Association of Barbershop Singers - BABS, holds a special weekend each year for all the directors of each chorus, to share new ideas and good practice regarding matters like directing, being a good leader and vocal techniques. Dave attended on behalf of Wight Harmony and enjoyed the presentation given by Jordan Travis, a highly sought-after speaker, vocal coach and adjudicator from America. 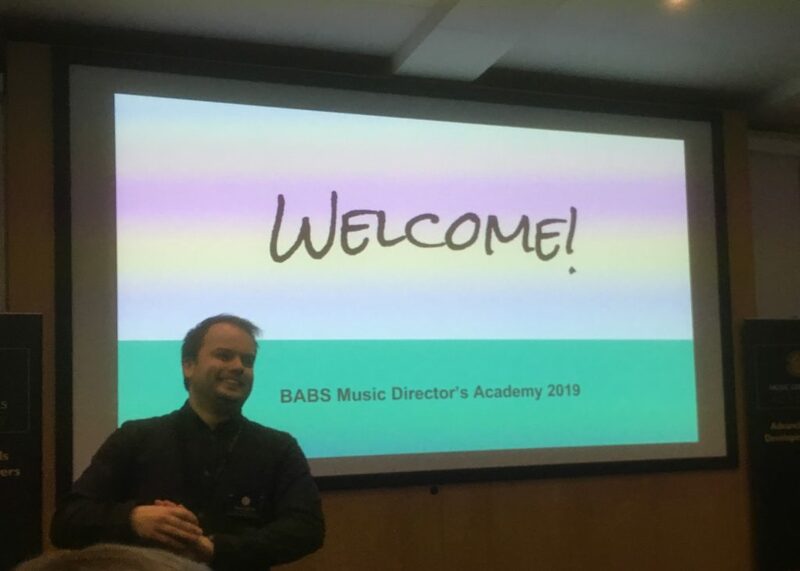 [Left - Alan Hughes, the BABS Music Services Director welcomes us all to the weekend]. As 2018 draws to an end, we celebrate the number of performances we have done over the past 12 months. It has been our privilege to perform on the Island [and the mainland] a total of 30 times! This includes some private sing-outs , public sing-outs , charitable sing-outs  and private occasions . We have also collected for our adopted charity at some of these events. Performing to an audience is a wonderful experience and we’d like to thank everyone who has come to watch us over the past year. December 2018: A very busy month! Really enjoying our sing-outs at Ye Old Village Inn in Bembridge. We enjoyed giving two performances there during the month, each with Christmas theme. We also sailed to Portsmouth and back on a Wightlink ferry, entertaining the travellers and raising money for Haylands Farm, our adopted charity. We were very honoured to be asked to sing at the Light of Love service at the Isle of Wight Crematorium; a very special occasion. 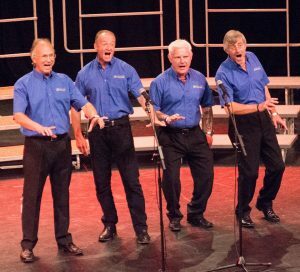 November 2018: Wight Harmony travelled across the Solent to take part in the Gosport Music Festival. The met one of the biggest number of competitors known in recent years but still managed to return with a 1st prize in the A Cappella section. Quaynote pictured with the adjudicator, right also returned with two 1st prizes in the Christian Music and Showtime Songs section. Part Exchange achieved a 2nd place on their first outing. 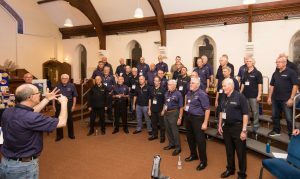 October 2018: We had the pleasure of inviting our nearest barbershop chorus Solent City from Portsmouth, for a joint rehearsal on the Island. Both choruses sang to each other, learned some tags and sang some songs together. Singers from both choruses thoroughly enjoyed the evening and plan to repeat the occasion. 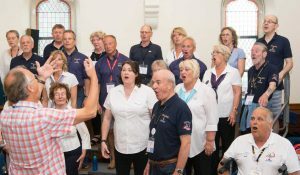 June 2018: Make Music Day 2018: We enjoyed a super evening with Wight Satin, the ladies barbershop chorus on the Island, together with some new friends, curious to see what a cappella style sing in the barbershop style is like. Following this special time together, there are now plans to create a mixed, ladies and gents choir! Our very own Steve Morris - club coach and club secretary - is voted Barber-shopper of the Year! Steve was nominated by members of the club because of all the things he does for Wight Harmony. 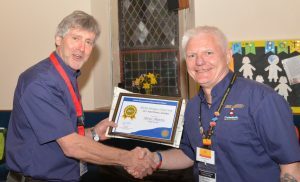 He is seen here receiving his award from David Parkinson, our chairman. Well earned Steve! 10 minutes before going on stage at Convention! May 2018: Another adventurous visit to the annual BABS [British Association of Barbershop Singers] Convention. Wight Harmony had lots of fun singing their new song for the first time - Over The Rainbow, now a very popular song in the repertoire. April 2018: A sad time as we say a warm and heartfelt goodbye to two of our singers who have passed away this month. 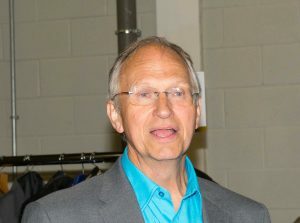 Dave Mackett, our current bass section leader passed away suddenly after suffering heart problems. John Blanchard, a super lead singer who had to leave the chorus because of ill-health, passed away too. Wight Harmony have been requested to sing at both their funerals. Losing close friends is always hard so it will be an honour to sing for Dave and John. March 2018 : A very successful time at the Isle of Wight Music, Dance and Drama Festival in the vocal sections. Wight Harmony achieved 1st place in the Male Choir contest, 1st place in the Community Choir contest and 1st place in the Barbershop contest! We're over the moon with the marks too 90, 91 and 92! November 2017: Wight Harmony has just returned from a visit to Gosport for their Music Festival and what a day it was! 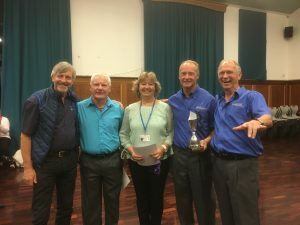 Competing against other barbershop groups on the South Coast, Wight Harmony won 1st prize in the Barbershop 18 voices and over Class and 1st prize in the A Cappella Class! Making the most of the day, we split our choir into two and won 1st prize in the Barbershop 8 - 18 voices Class too! Quaynote claimed two 1st places in the Barbershop - 8 voices and under Class and the Christian Music Section. Singing on the ferry both ways provided some on-board entertainment! October 2017: Thank you everyone who came to our 40th Anniversary Show at Medina Theatre! And a huge thank you to all the performers - Unity Stompers Jazz band, Company-B, Wight Satin, Cinnamon, and Quaynote [left]. The night was a very special occasion and a tribute to everyone who took part. Thank you to all the gentlemen who came along to our Learn To Sing Course. We are running an extension to it and the guys currently with us are doing an amazing job picking up skills for close-harmony singing - a cappella style. 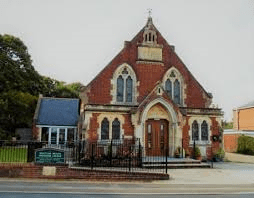 If you are interested, you do not have to wait for a learn To Sing course, just roll up on a Thursday night at Wootton Methodist Church, and you will be made most welcome. 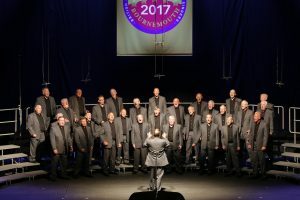 May 2017: Following our A Cappella Showcase at Trinity Theatre in Cowes, we performed at the Bournemouth International Centre on the South Coast for the British Association of Barbershop Singers [BABS], along with 36 other males choruses in a competition. Wight Harmony raised their previous percentage score by 5%, a great achievement by the Island boys! There is plenty of car parking opposite. There are regular buses to Newport and Ryde via the No.9 service.